How does cybersafety benefit communities and organizations? Our connected society enables us to reach information and communicate with each other around the world. Our connections with people and with businesses made possible with technologies have in many ways never been stronger. Unfortunately the technologies that make our lives better also expose us to risks and harm. KnowledgeFlow CyberSafety Foundation, a not for profit foundation, that works with businesses and education institutions, as well as adults, youth and children to educate about cybersafety issues, how to navigate the online world in the safest way possible and what to do if a problem arises. KnowledgeFlow CyberSafety Foundation does this through working with businesses (including our certification programs), working with school boards and schools (including becoming a school leader) and, of course, working directly with our communities through outreach and education programs. If you want to know more about KnowledgeFlow CyberSafety Foundation’s certification and leadership programs, or about our community outreach programs, please contact us at info@knowledgeflow.ca. Since 2010, KnowledgeFlow has focused exclusively on bringing cybersafety into the spotlight, introducing solutions and providing education that enables communities to take a stand against online abuses. We believe young people must have a sense of entitlement about the Internet. That’s right. It is imperative for everyone to take ownership of their online activity if we are going to eliminate cyberbullying, privacy abuses, trolling and cyberharassment in schools and in the workplace. In today’s fully connected society, we enjoy combining the real world with the virtual to augment not just reality, but perception itself. We augment our offline world with digital perception, we interact with home appliances from exotic locations and we have a reasonable expectation of privacy and online safety. Unfortunately, this new frontier is being abused, victimizing not only our virtual reality, but threatening us in the real world. When our loved ones are intimidated by faceless attackers and humiliated by corrupting the fragile fabric of the online world, we rely on cybersafety to regain control and protect our families. Our strictest rule is also our simplest: we have a zero-tolerance policy on cyberbullying, online victimization, privacy breaches against minors, cyberfraud against seniors and other malicious activity facilitated by abuse of technology. We love technology and hate to see parents feel forced to keep their kids away from it, seniors afraid to answer the telephone and communities victimized by cybercreeps. 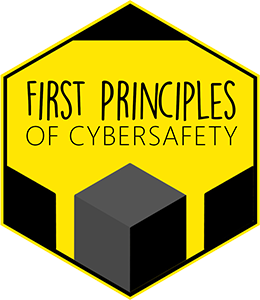 First Principles is our school and municipal cybersafety program. It is a data driven, knowledge based, unifying framework for preserving a high degree of cyber situational awareness in all situations that present a risk of technology abuse, digital harassment and online victimization. Our principles are the guiding force for an innovative program delivered in schools, in partnership with municipalitiesand boards of education. All content is authoritative, developed by government agencies and accredited organizations. KnowledgeFlow is exclusively staffed by certified professionals, uniquely qualified to present, implement and support cybersafety activities on a national scale. 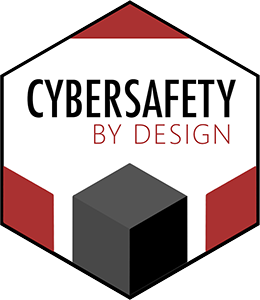 The 7 Principles of Cybersafety by Design include guidelines for professional organizations to employ in the responsible implementation of safe online social networks, learning environments, online communities, Web sites and mobile applications throughout their life cycles. CbD helps to level the playing field between organizations and audiences by asking the tough questions about information use, access, protection and control. Questions of duty of care, disclosure, consent, openness and appropriate use. KnowledgeFlow’s Cybersafety Certification Platform (CCP) is our unified solution for bringing First Principles to students, educators and parents right across Canada. KnowledgeFlow’s CCP is a revolutionary system that uses highly effective learning techniques, multi-platform availability and gamified incentives to educate broad audiences on an on-going basis. Students and educators can maintain control over their achievements, enjoy rewards and proudly share their certificates throughout the year. KnowledgeFlow is proud to partner with Municipalities, Law Enforcement Agencies, Teachers, Schools, Parent Councils, Businesses and Individuals who support are dedicated to Cybersafety. We have also forged productive alliances with Seneca College, UOIT and Ryerson’s Privacy & Big Data Institute for research and publishing initiatives. Become a Certified Cybersafety Champion in your area. Start a revolution in your community! Take the first steps in becoming a Certified Cybersafety Champion (CCC) and help build the next generation of Internet defenders, educators and leaders. Do you represent an organization that supports cybersafety? If you are interested in hackproofing communities, why not become a Cybersafety Sponsor? You can support one seminar, or the entire year’s presentation. With your contributions we can reach broader audiences from seniors to immigrants, small businesses and community groups. Tell us about yourself and why you’re interested in cybersafety.